The following example demonstrates how to generate dynamic series that use a collection of view models as a context. Create a class that represents a single DataPoint and also a ViewModel class with a property to hold the collection of DataPoints for each series. Create two methods to help us create a collection of view models and create sample data for each one. Here r is a random number. Set the created collection of view models as a Source of the ChartSeriesProvider. 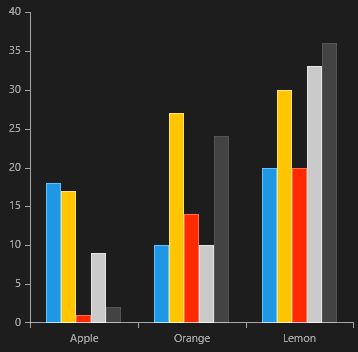 Finally, create the chart using XAML. This sample uses the ItemsSourcePath property to set the path to the property of the view models.